She grew up among the legends of comedy; Milton Berle, George Burns, and Sid Ceasar to name just a few. She was referred to as “Danny Thomas’ little girl” or “That Girl.” But through it all, Marlo Thomas has been her own woman, independent, opinionated, and very appreciative of her loving family. Growing Up Laughing is as much a story of Danny Thomas as it is of his daughter Marlo. The well-known actress recounts a myriad of stories of her dad, his career, and the company he kept within the pages of this book. There are many tales of Danny Thomas with “The Boys,” (Red Buttons, Milton Berle, Art Linkletter, Don Rickles, Carl Reiner, etc.) that are both touching and humorous. It quickly becomes clear that this was a tightly knit group of friends. The Boys liked to hang out at Hillcrest Country Club and they wanted their friend Thomas to join them for Sunday afternoons at the club. The only problem was that the club was restricted to Jews and Thomas was Catholic. The board had to decide if an exception would be made and with all of Thomas’ friends pushing for him, he was allowed honorary status. They went on to share many great times at the club. The Boys were also constantly trying to one-up each other, creating havoc as they all would surrender in laughter. The book is filled, particularly the early pages, with the exploits of these famous comedians and what they did and said to keep their friends in hysterics. Growing up in Beverly Hills, Marlo didn’t have the typical middle-class American suburb upbringing, but rather the privileged childhood that came from her elite zip code. Still, Marlo and her two siblings remained amazingly “normal” and happy and avoided many of the pitfalls of other celebrity children they went to school with. Throughout the book, the reader gets a sense that her’s was a happy life, full of laughter and love. If you’re looking for ugly gossip on those famous comedians of the past, or of celebrities Marlo has encountered in her own career, you will be disappointed with this book. The author is at all times respectful of others and is far more interested in recounting the funny in life rather that the dirt. There’s a chapter on “The Donald,” (no, not that one, the one from That Girl) Ted Bessell, who played Donald Hollinger on That Girl. We also meet Lew Parker, who played Marlo's father on the show. We're introduced to many greats Marlo has worked with such as Orson Welles. In addition, Marlo recalls her awakening as a feminist and her fight for women’s rights alongside Bella Abzug and Gloria Steinemn and her courtship with future husband Phil Donahue. 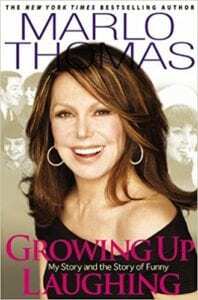 Growing Up Laughing is not just a memoir of Marlo Thomas but a look at what “funny” is and what makes a good comedian. Interspersed throughout the book are interviews the author conducted with over 20 well known comedians. Through her questions, we get to see what in their backgrounds led to their life in comedy, how they struggled, and what they find funny. There are also a LOT of jokes in this book, some from Marlo but most from those comedians who have touched her life. You can’t help but laugh as you read this memoir. Quill says: Funny and fun – a great look back at the comedians of the past, as well as an enjoyable look into Marlo Thomas’ life.